At MidAmerica Basement Systems, we understand that a basement represents a very large section of space in your home. If you live in a one-story home, your basement could be half of your total square footage! If you're interested in protecting your home with a quality waterproofing system, call us at 1-844-218-0509 or click the button below to request your no-obligation consultation with a waterproofing specialist. We will provide you with a free estimate to install a waterproofing system in your home in Peoria, Cedar Rapids, Davenport, Waterloo and nearby! Locally Owned And Operated Contractors: MidAmerica Basement Systems is locally owned and operated and has been in business since 1990. They're a stable, well-established company that's there when you need them! Basement finishing is the most cost-effective way you can add living space to your home. Unlike building an addition on your home, the basement is already there, and so are the pipes, electrical wires, and utilities you need. A home with a wet basement becomes much more difficult to sell. In fact, a wet basement is one of the most serious "red flags" that deter buyers. 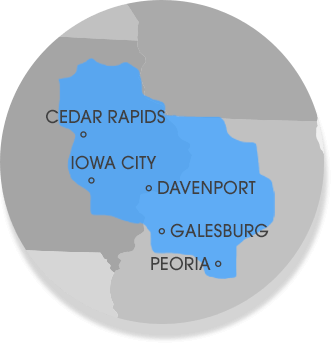 If you live in Davenport, Peoria, Waterloo, Iowa City, Normal, Iowa City, Dubuque, Rock Island, Clinton, Moline, East Peoria or nearby, we're the contractors for you! We offer free basement waterproofing quotes to homeowners within our service area.